Today I have the honor of writing a guest post on Frosting for the Cause and to share with all of you about one of the most important women in my life, my beautiful sister Lisa. It’s not the first time I’m writing’s about Lisa and paying tribute to how incredible I thought she was and it certainly will not be the last. One of my earliest and fondest memories is of my third birthday when I got an easy bake oven. Despite the several years in our age difference, Lisa would pretend and make pies with me. I remember my first day of kindergarten when Lisa walked hand and hand with me to class, introducing me to my teacher. I went to my very first movie with Lisa, riding the bus through the south side of Chicago. Going to my first rock concert to see Kiss the band. Shopping for dresses for my first school dance. And my first driving lesson, I think she was frightened. I had many firsts with Lisa by my side, you can see why she’s somewhat of an iconic image for me and always will be. I’m super lucky I had her in my life, she taught me so much. Lisa was talented in so many ways… a writer, a peacemaker, an attorney, an artist, a musician, a chef and a baker. Picking a recipe to share with you today was not easy, we shared a love for all desserts. I had the help of her lovely daughter Elizabeth in narrowing down the selection. We knew one thing, Lisa was a chocolate lover – so we settled on these mocha whoopie cupcakes with a whipped cream topping in honor of her memory. I think she would have loved them. I would also like to take a moment to reflect on some other wonderful people in my life who have been affected by cancer too, Christosimos Michelson, Peter & Petros Angelakos & Lisa Cocchia – you will always hold the sweetest memories in my heart. Recipe adapted from “Delicious Cupcakes” cookbook given to me by my sister Lisa’s daughter, Elizabeth. Preheat oven to 350 degrees. Line cupcake pan with baking cup liners. Combine espresso coffee powder, butter, sugar, honey, and water in a sauce pan on medium heat, stirring, until sugar has dissolved. Bring to a boil, then reduce heat and let simmer for 5 minutes. Pour into heatproof bowl and let cool until ready to use. Once the mixture has cooled, sift in the flour and cocoa. Dissolve the baking soda in the milk, then add to mixture with egg and beat together until smooth. Spoon the batter into cupcake cups. Bake the cupcakes in preheated oven for 20 minutes, or until well risen and firm to touch. Transfer to wire rack and let cool. While cupcakes cool, prepare the whipped cream topping. In a mixing bowl combine the heavy whipping cream, vanilla and sugar, mix well. Cover and chill the bowl and wire whisk in the refrigerator for at least 1 hour. Once chilled, beat the mixture until stiff peaks form. Fill a pastry bag with whipped cream topping and pipe onto cupcakes in large swirls. Sift with unsweetened cocoa dusting lightly. Eat immediately! These came out light and fluffy, a recipe my sister would have made on a regular basis for her family. I can’t share these with my sister’s family as we live in different states. 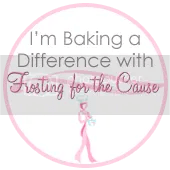 Part of the commitment for writing at Frosting for the Cause is donating your baked goods to a hospice or cancer center. I’m donating these scrumptious cupcakes to the VA nursing home down the street, where some pretty incredible heroes get to spend the evening of their lives. I’m grateful I had the opportunity to get involved with this cause – it was fun! If you’re interested please check out how you can help too at Join Us @ Frosting for the Cause. What. Wonderful post Georgie and the picture ps Lisa…..just perfect. We are having our first give away on Tuesday Nd we are so excited. Come over and check it out. We would love for you to be a winner. What a beautiful, sad, touching post… and a lovely, heart-warming tribute. I also remember my brother through the food I make. And I love these mocha cupcakes. You my dear are one my favorite bloggy friends. When you do come to NYC – you can stay here in CT with me, bring the hubby too – the doors open. Hi Kristen, Thank you for the kind words. I love what Paula has created, a tribute site for people to share and connect. Sending you the loveliest wishes for you and heartfelt thoughts on your sister. Glad to connect with you!